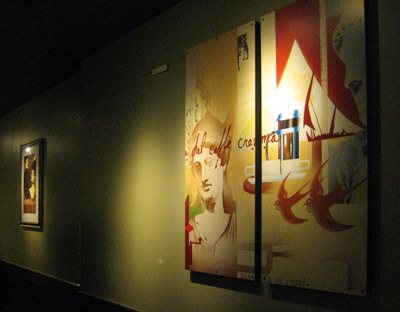 The CONSTELLATIONS series is designed to reflect phenomenal changes in our culture and societies. 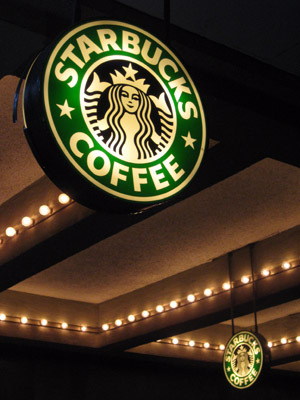 Star Constellations are the symbols of the heroes of ancient times, mythological characters known for their outstanding deeds. 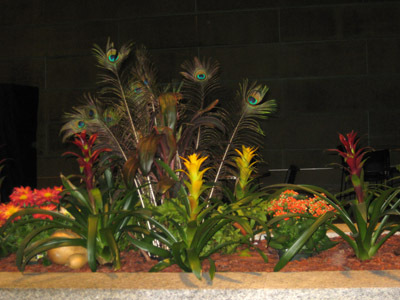 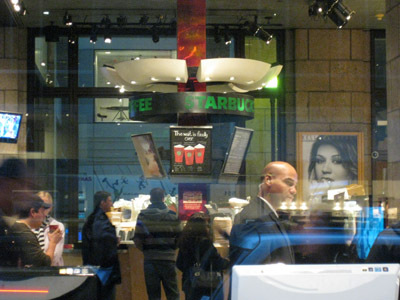 We now live during the era of rapid transformations. 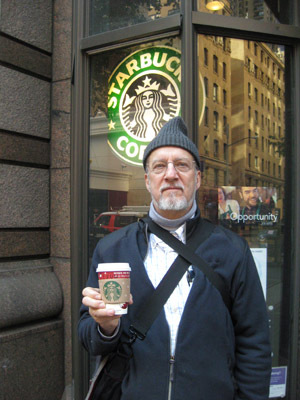 The Constellations Project creates a new mythology, e.g. 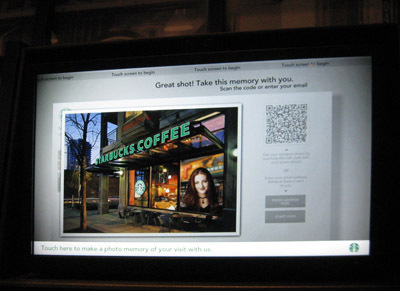 the interaction of personal and corporative history, and records it on the internet with locative media. 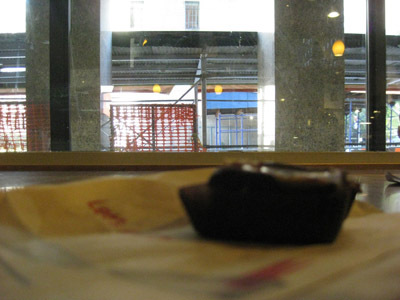 The sky has always had mystical references to a parallel existence. 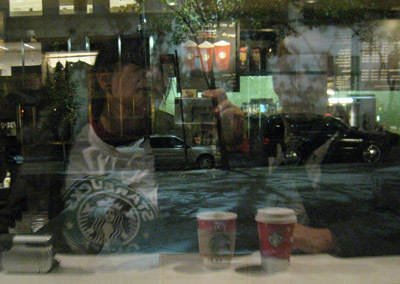 Now there is another version of parallel existence – virtual reality. 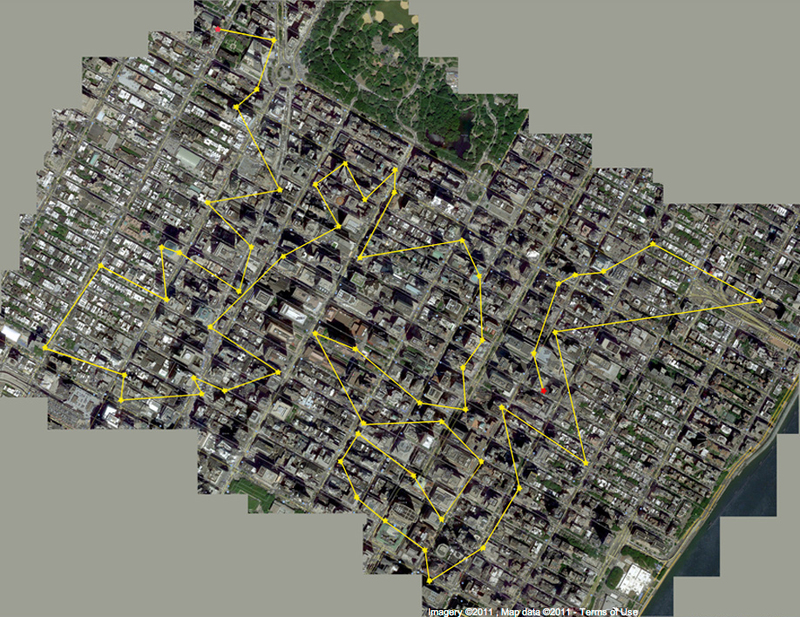 New Constellations are created to inhabit our new heavens by connecting the dots between different sites with an on-line open source tracking system. 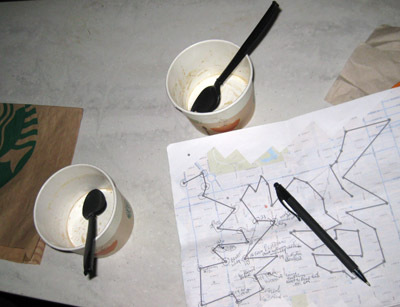 An important part of this project, while creating virtual constellations on-line, is the real-life interaction with each location in space and time. 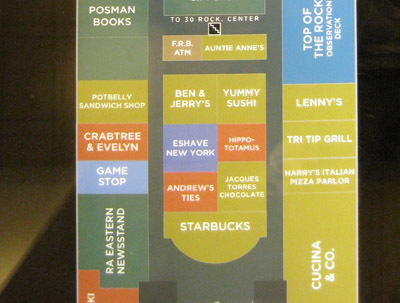 The first two constellations are about two giant corporations that were started as small businesses by young intellectuals in different university towns back in 1971. 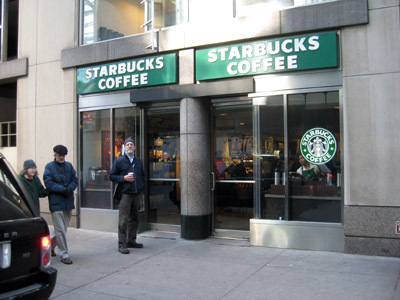 One is thriving and the other is dead. 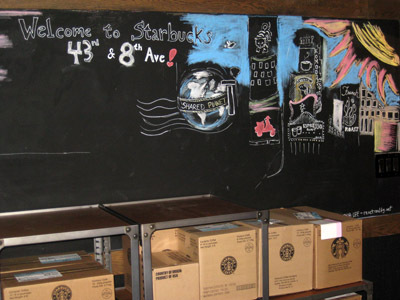 To draw this map we visited 59 Starbucks. 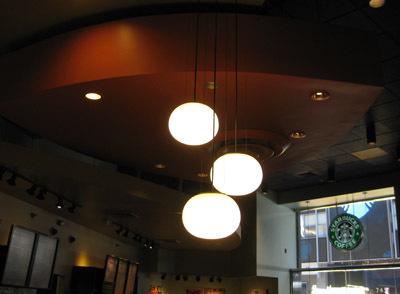 Click on each star for details. 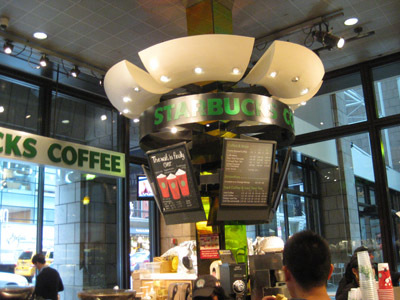 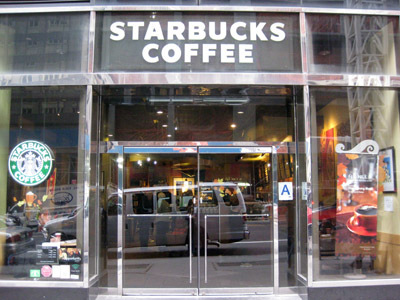 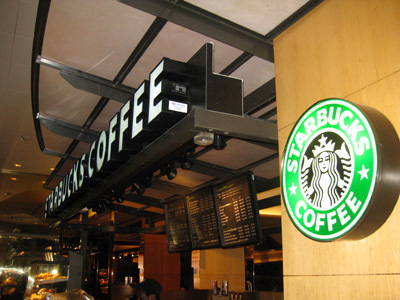 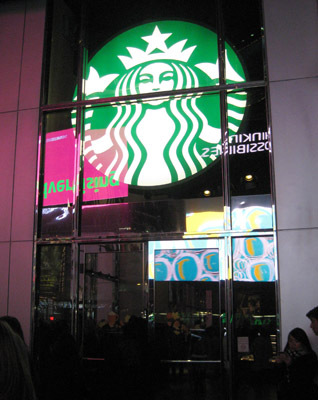 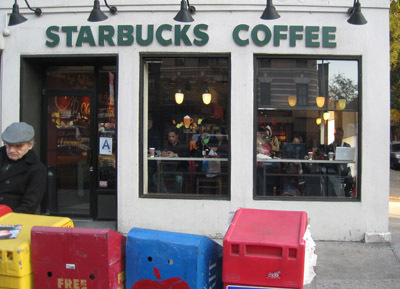 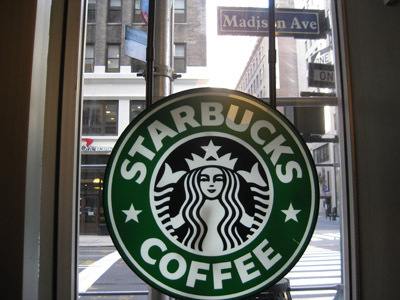 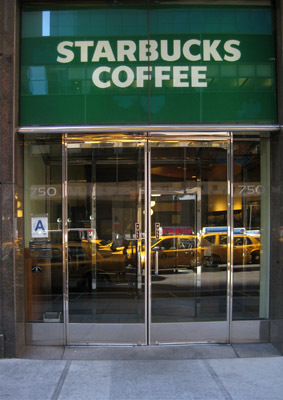 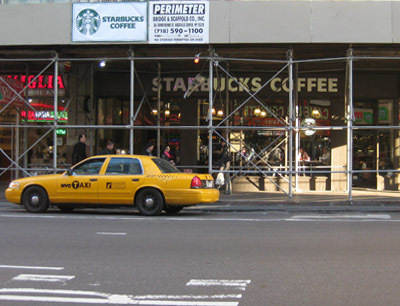 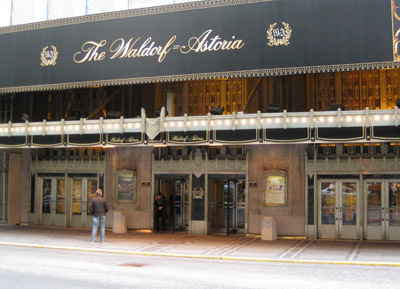 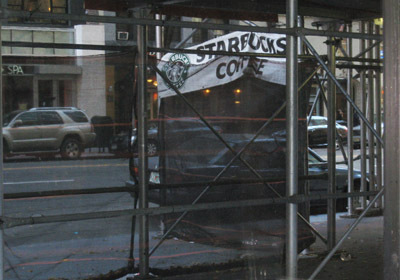 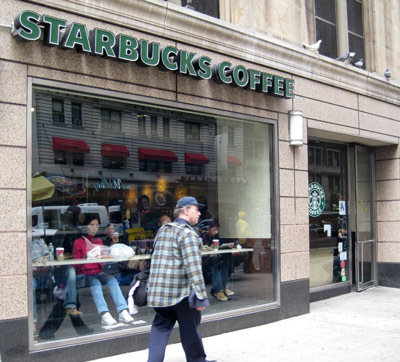 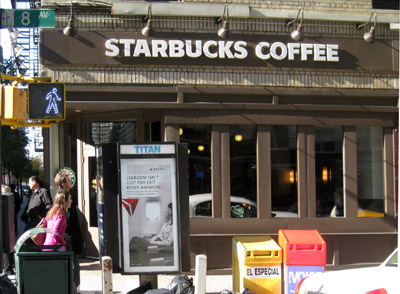 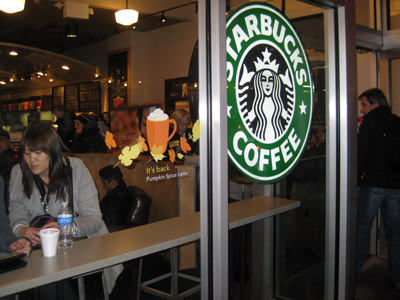 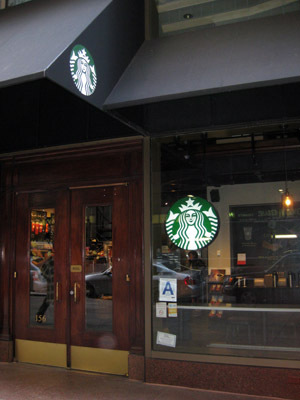 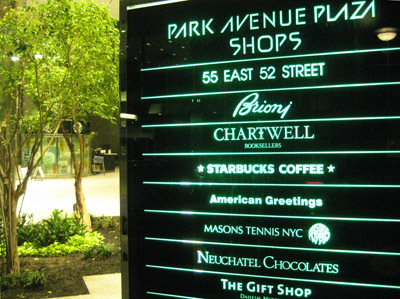 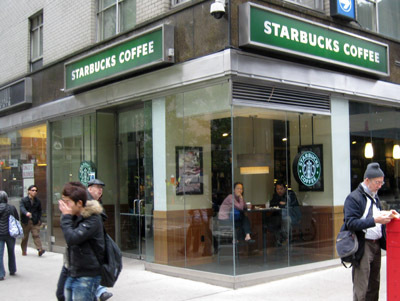 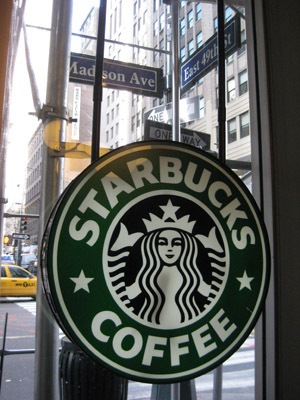 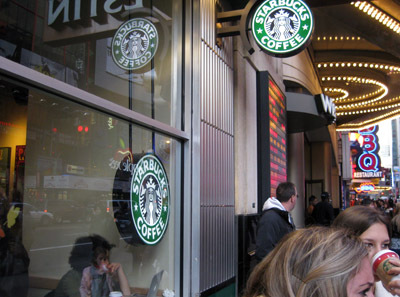 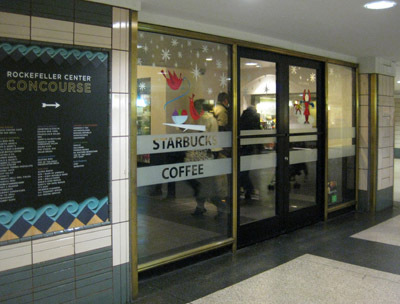 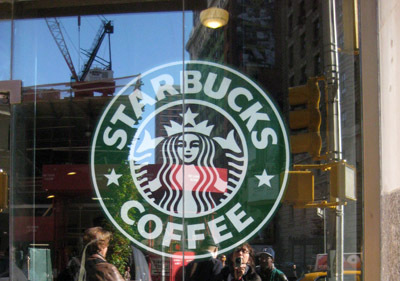 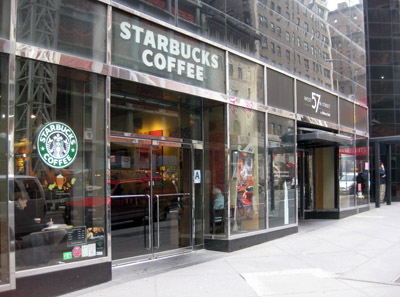 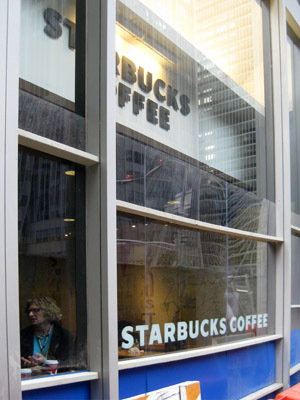 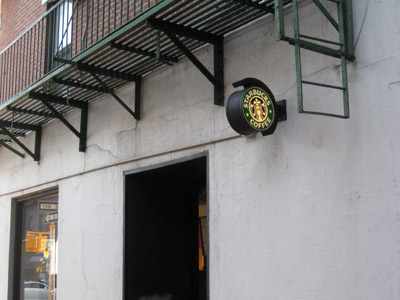 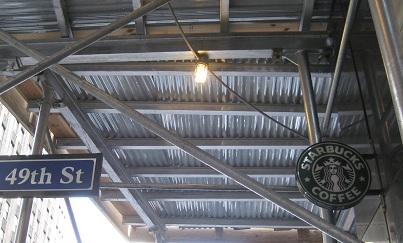 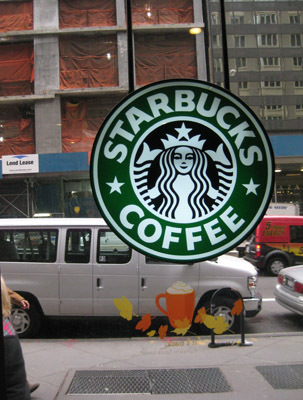 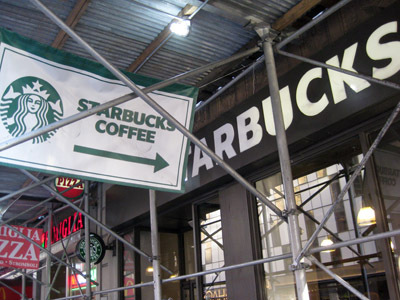 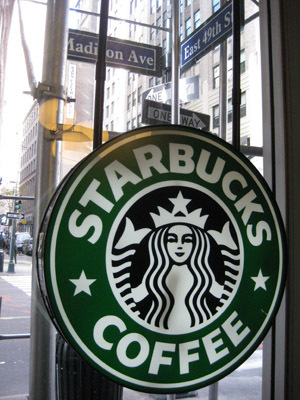 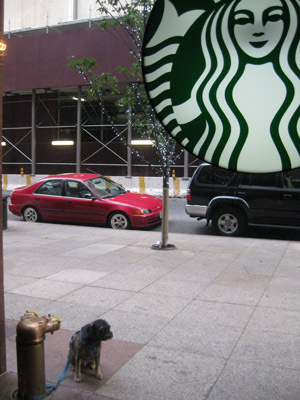 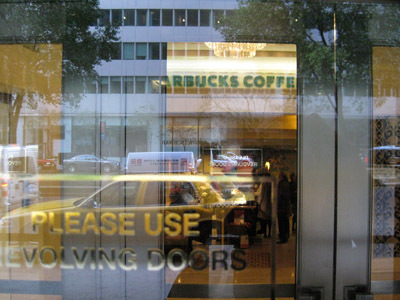 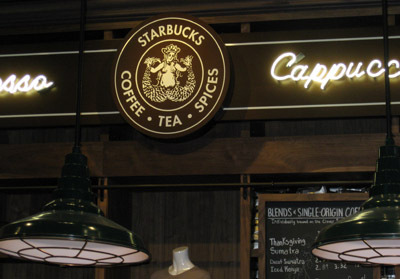 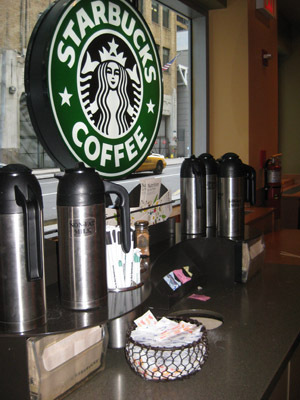 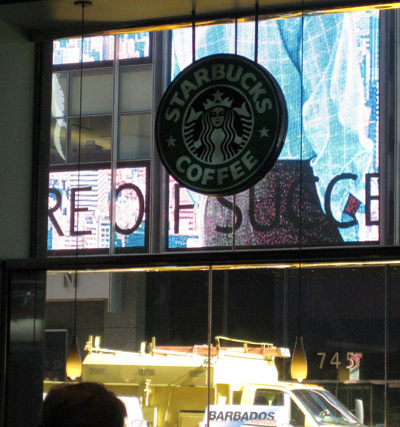 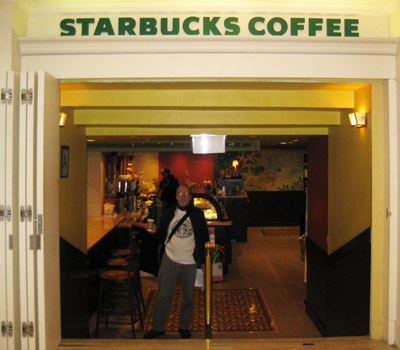 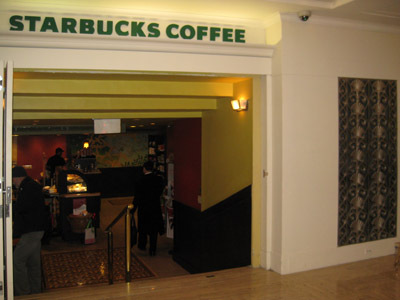 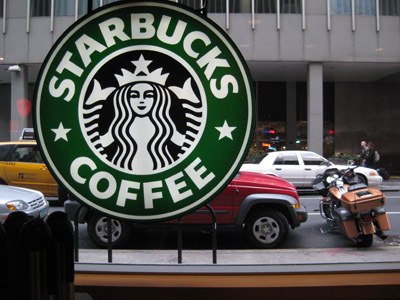 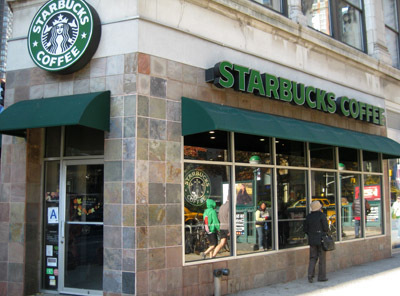 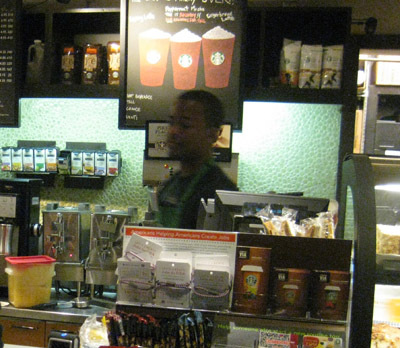 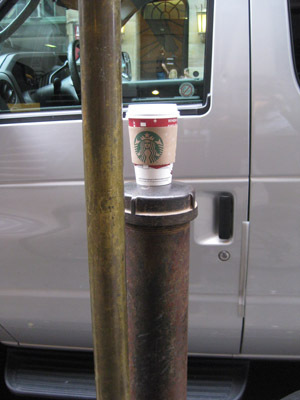 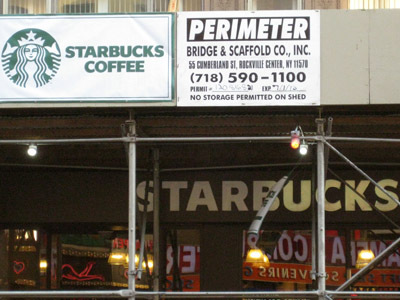 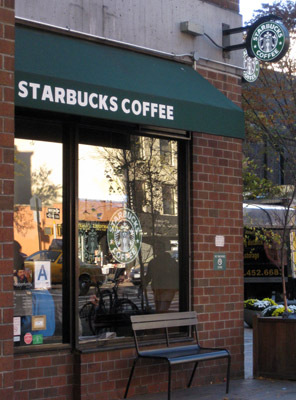 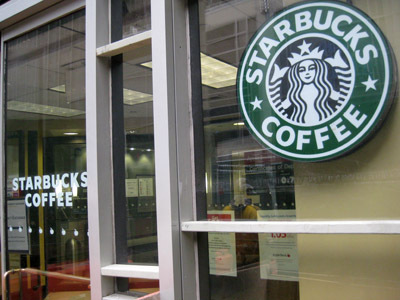 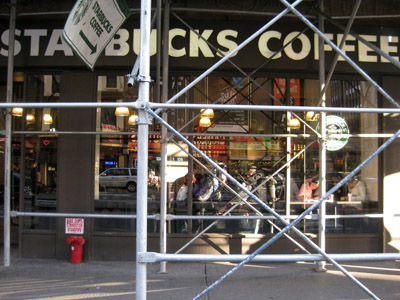 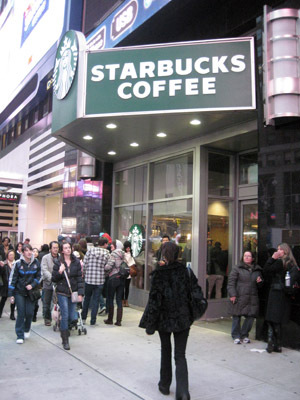 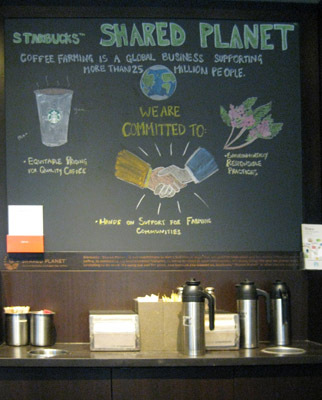 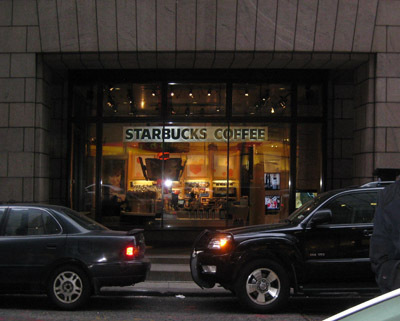 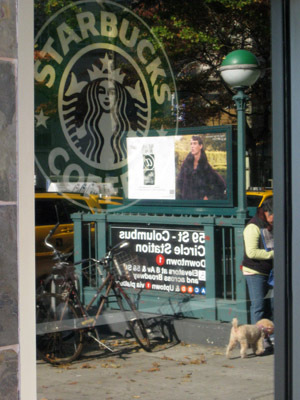 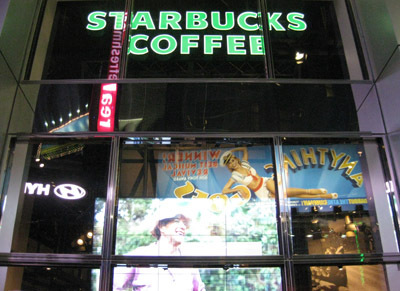 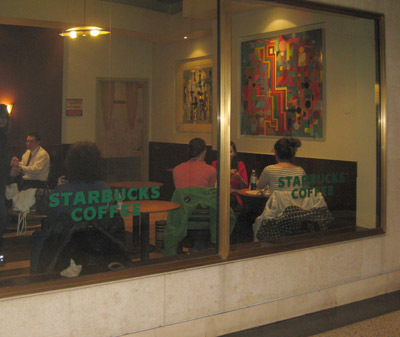 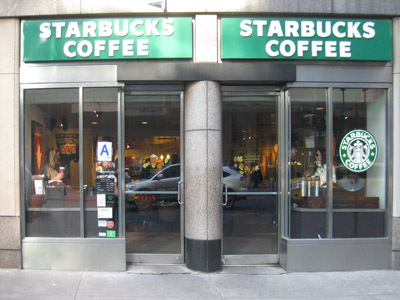 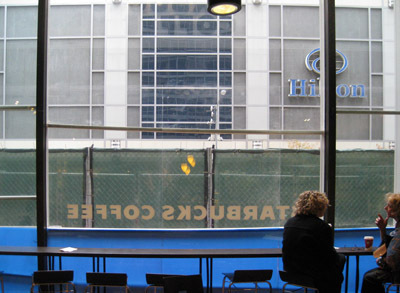 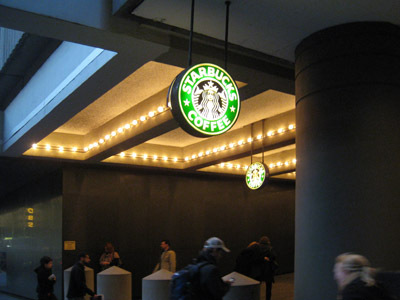 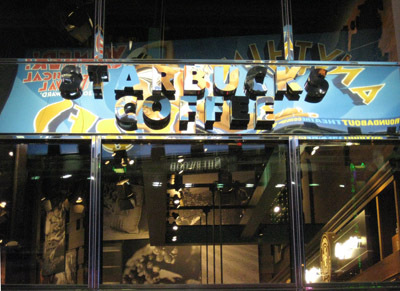 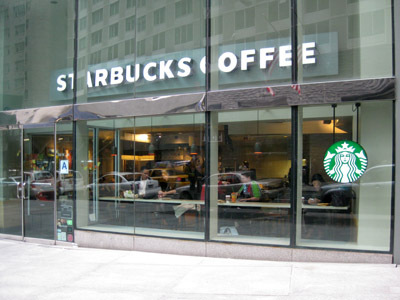 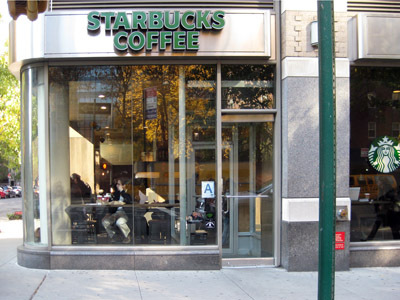 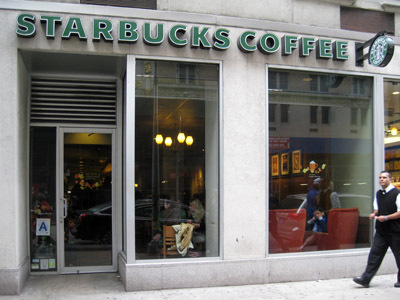 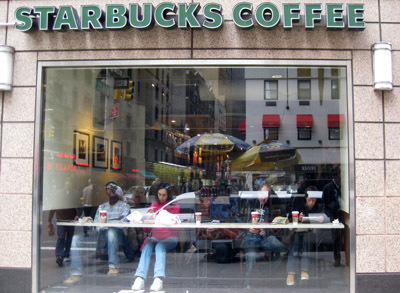 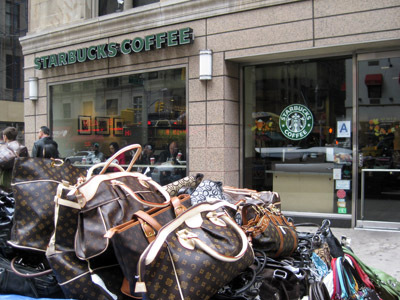 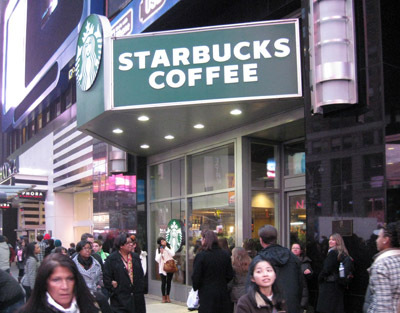 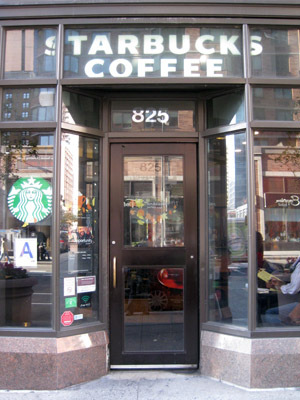 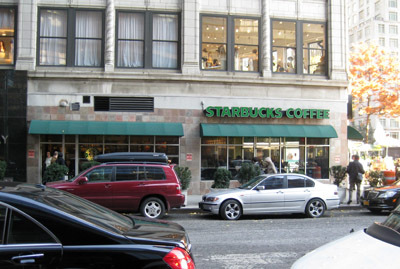 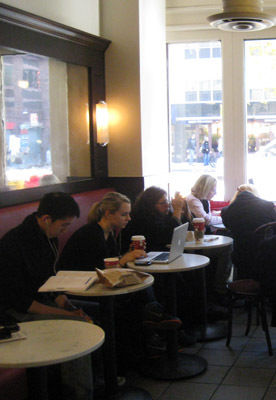 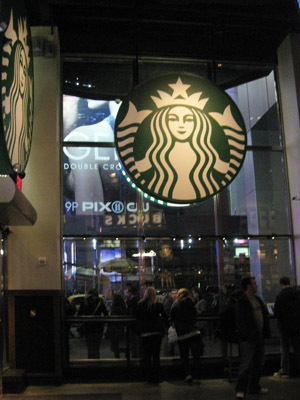 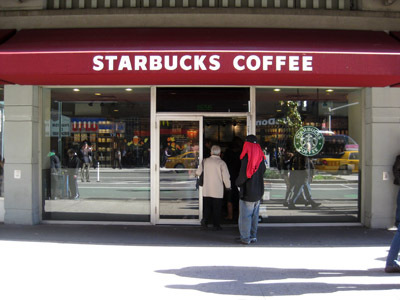 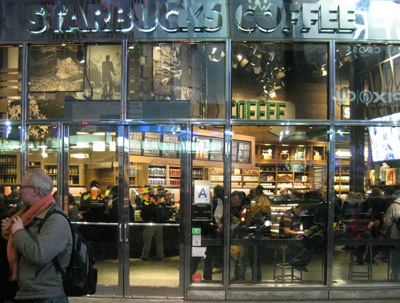 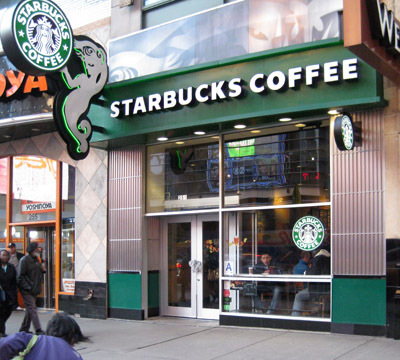 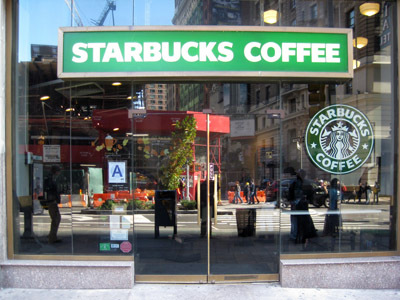 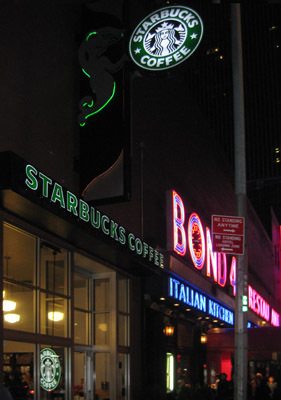 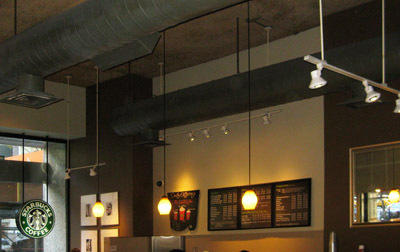 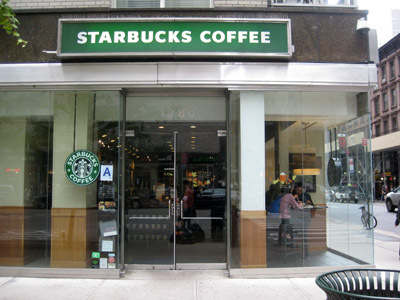 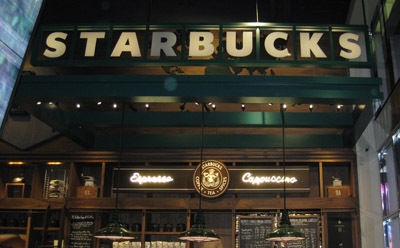 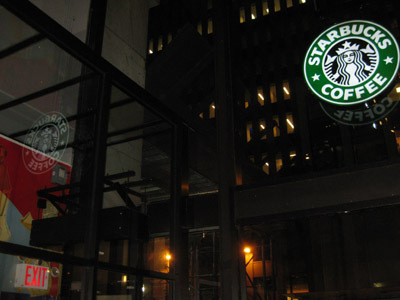 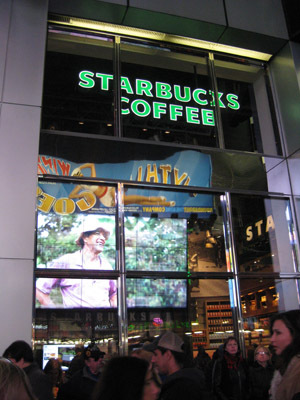 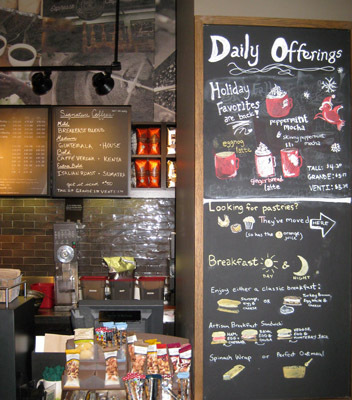 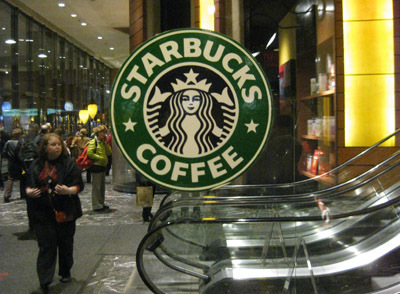 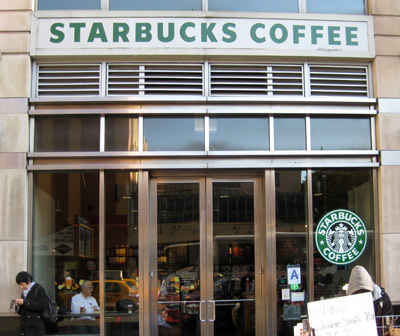 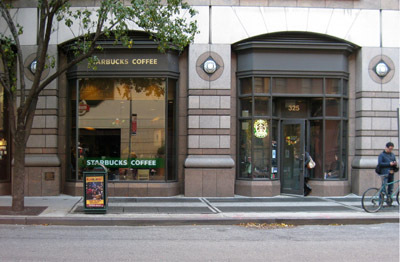 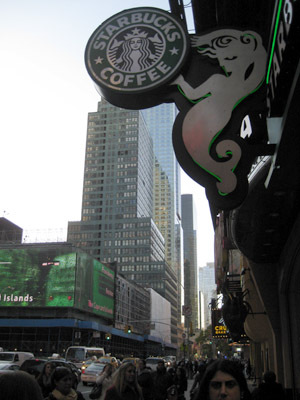 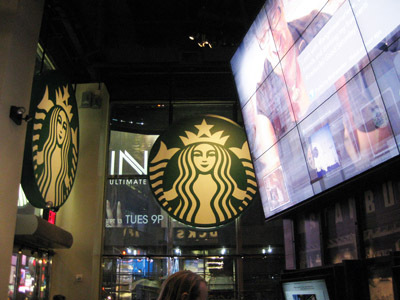 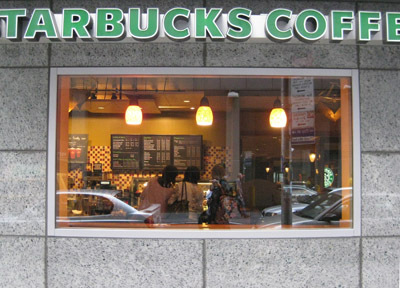 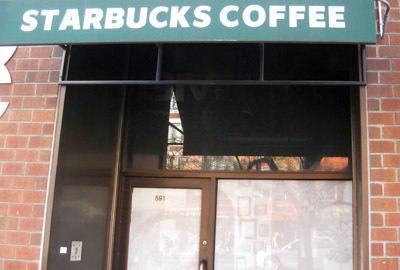 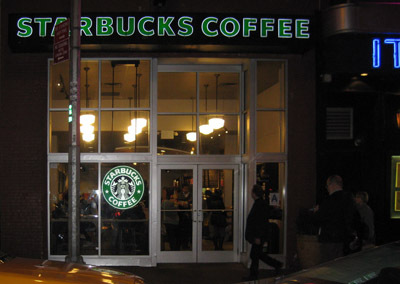 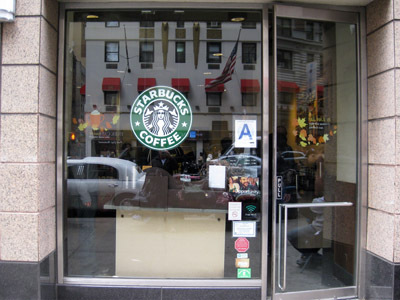 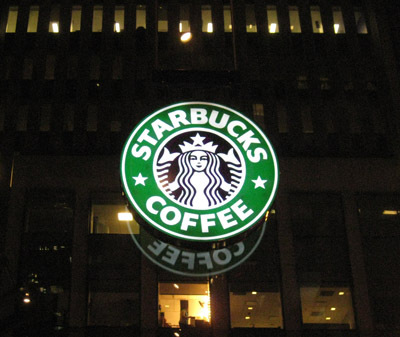 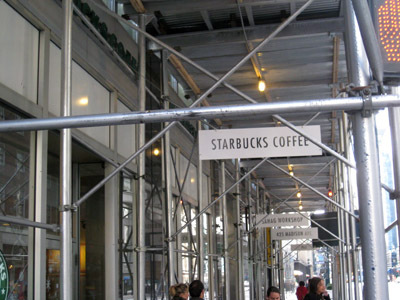 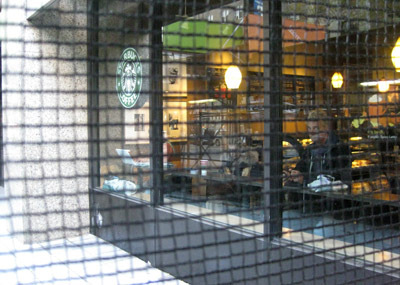 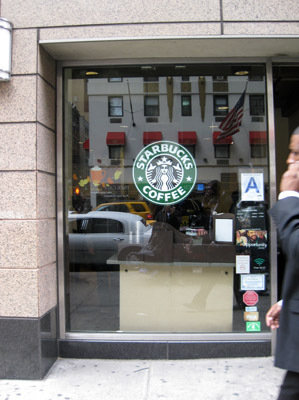 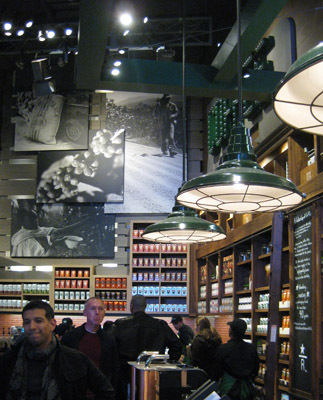 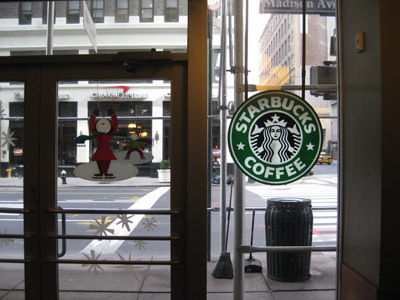 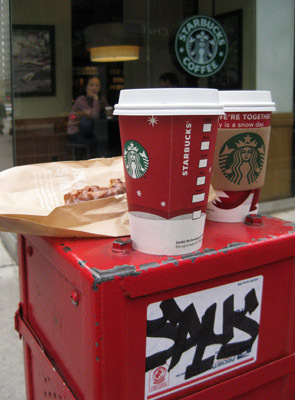 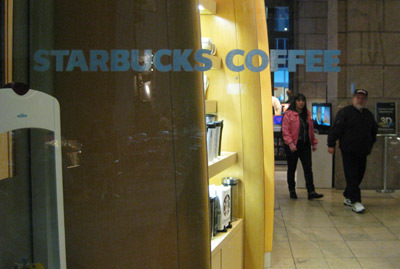 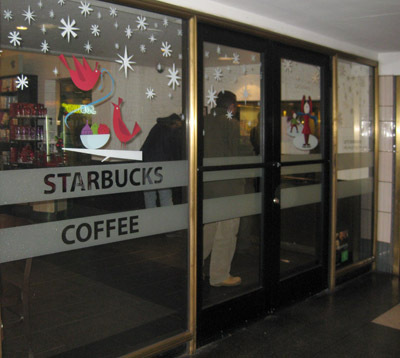 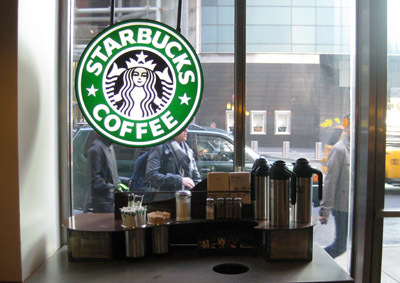 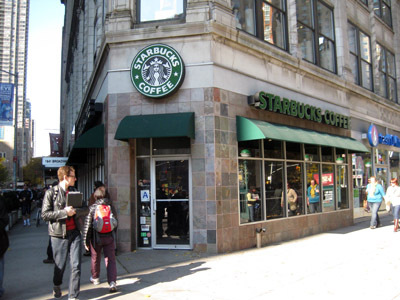 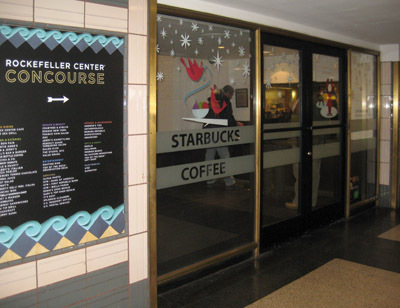 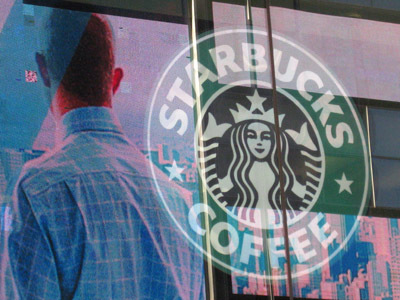 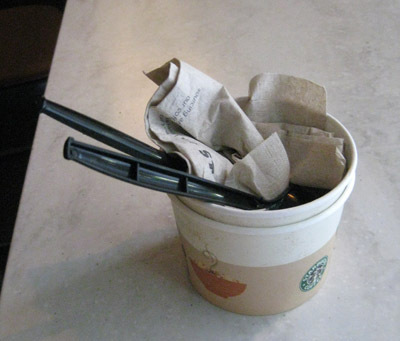 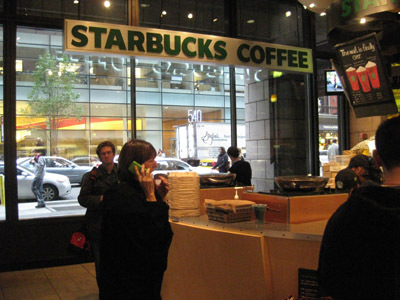 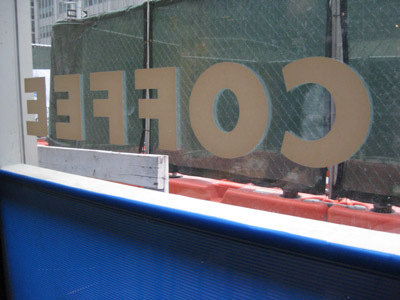 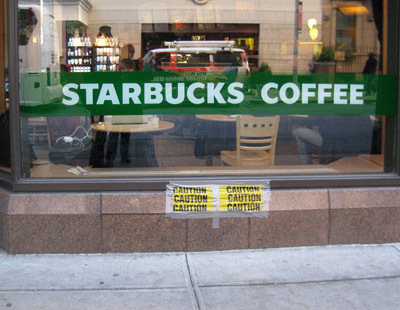 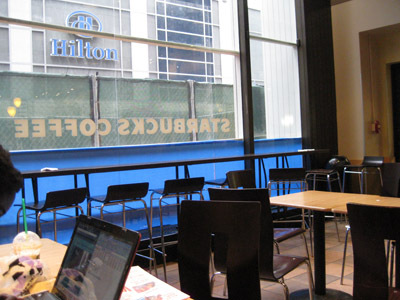 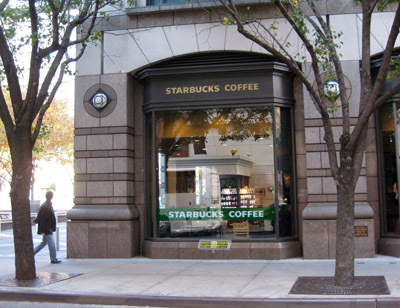 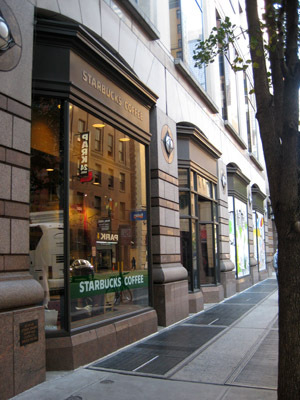 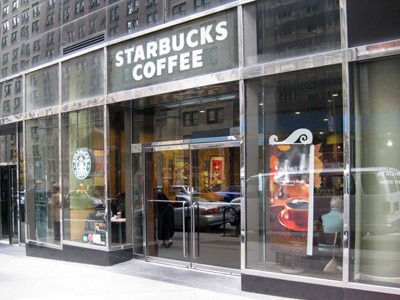 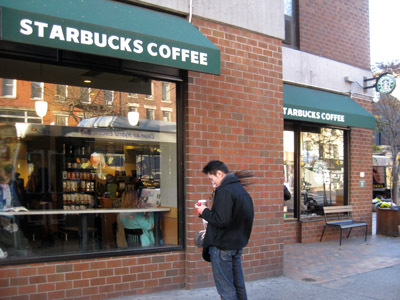 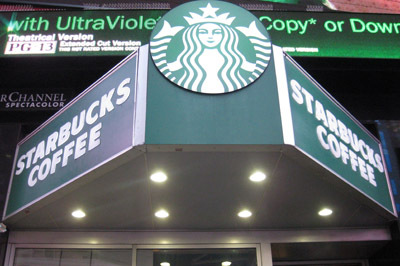 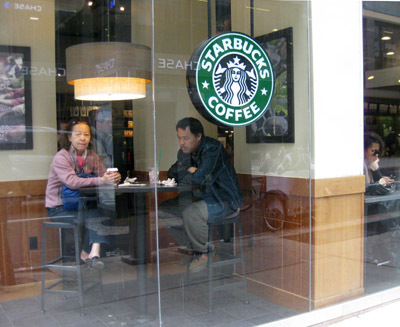 This Constellation Project started with the discovery that within an area of several blocks in mid-town Manhattan there are 59 Starbucks Coffee Shops. 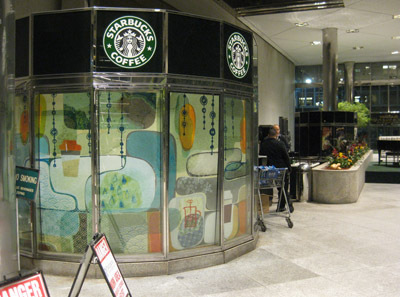 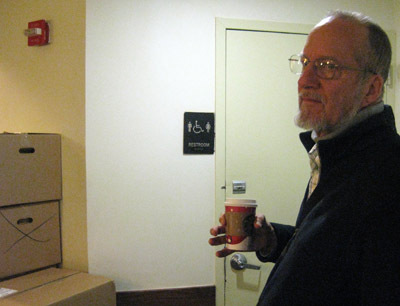 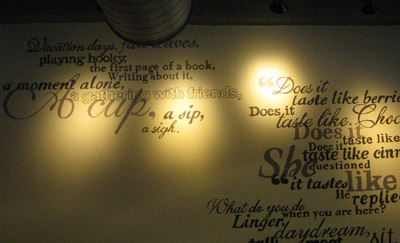 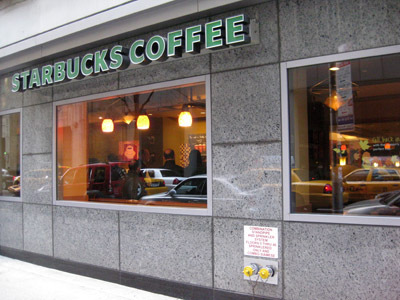 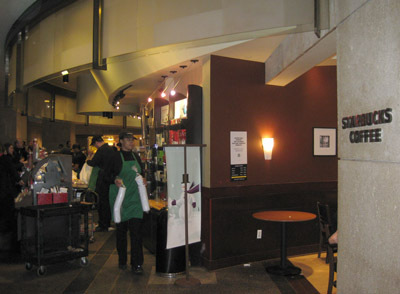 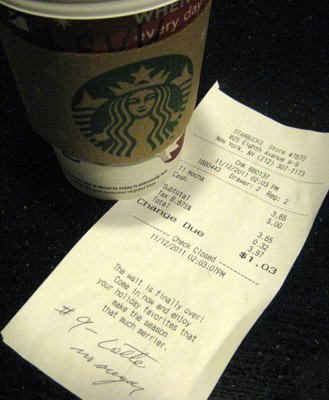 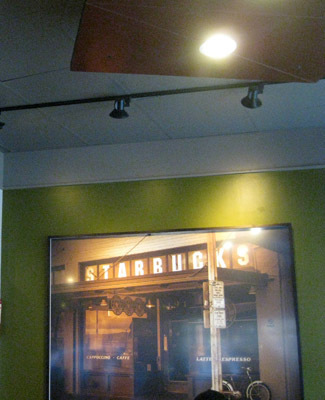 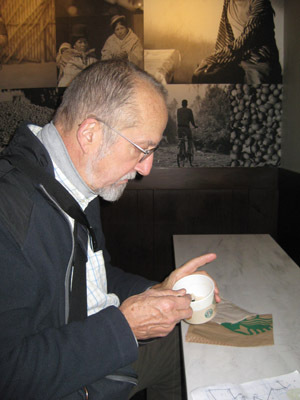 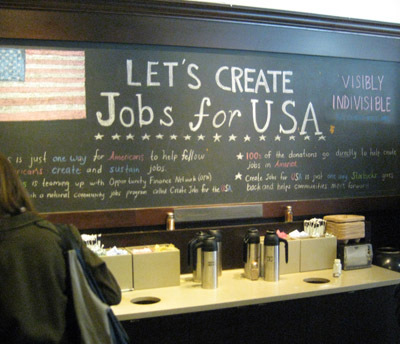 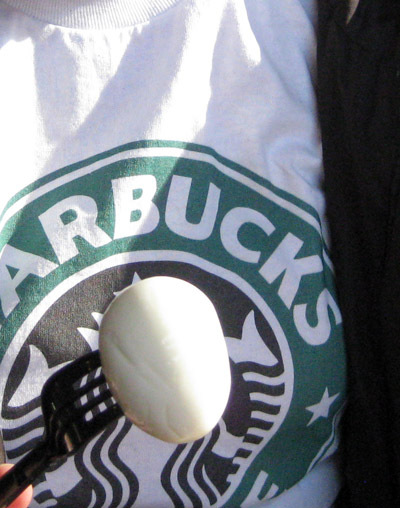 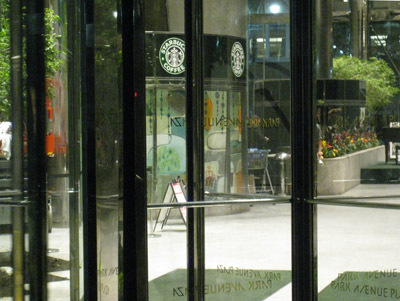 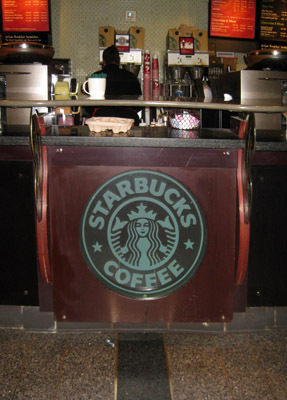 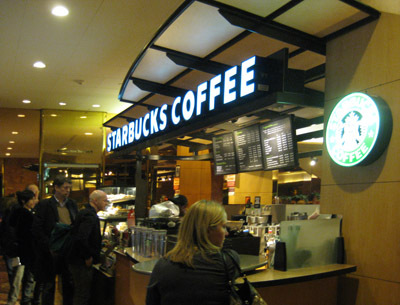 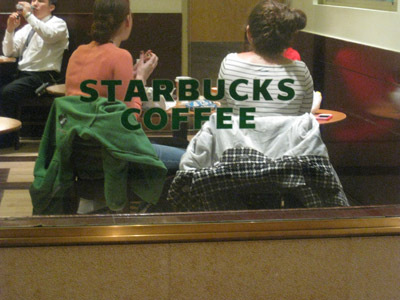 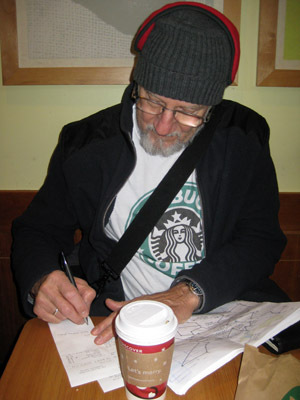 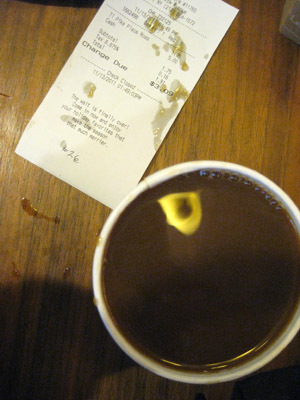 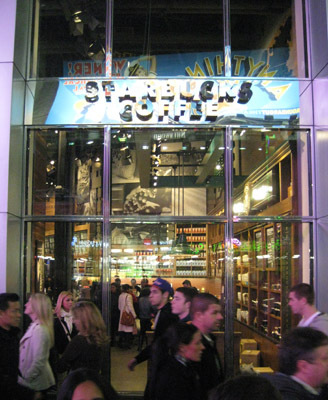 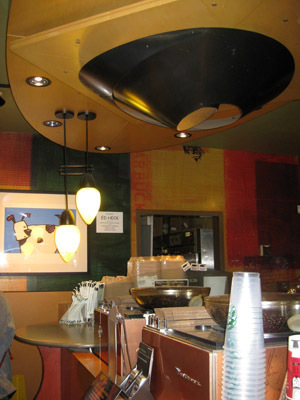 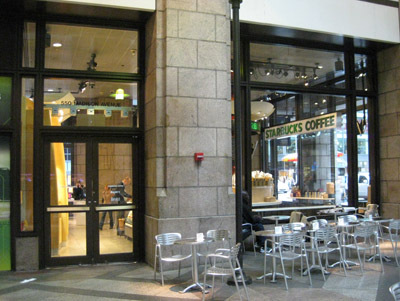 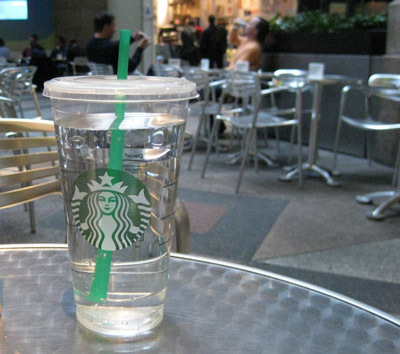 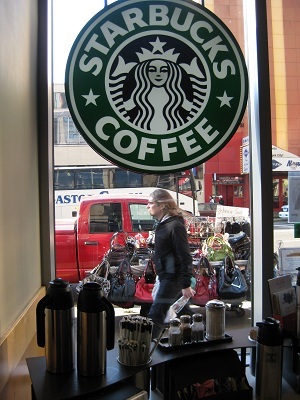 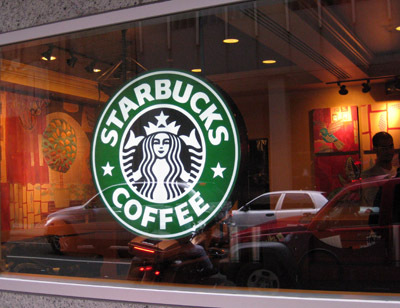 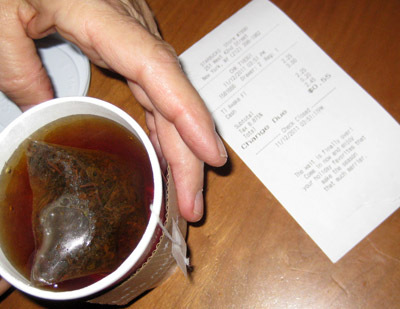 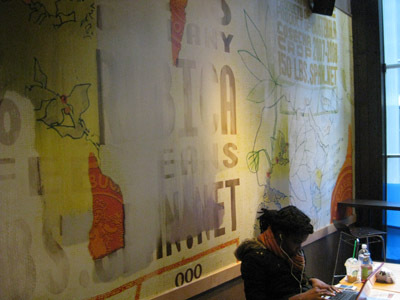 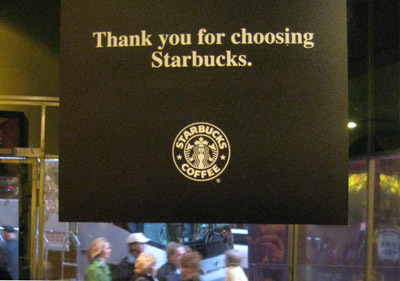 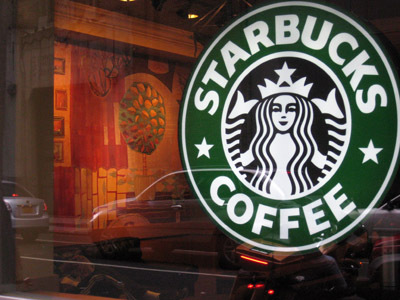 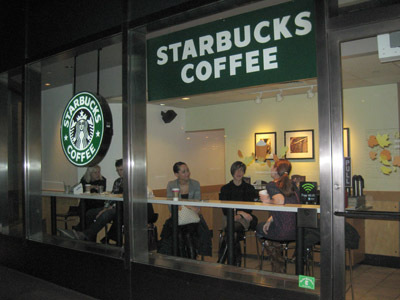 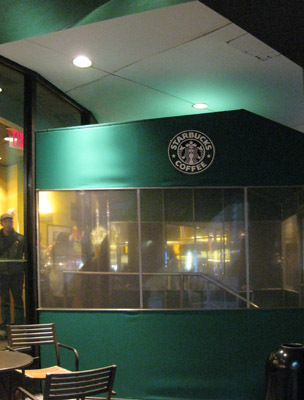 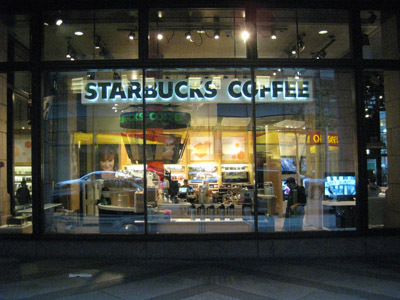 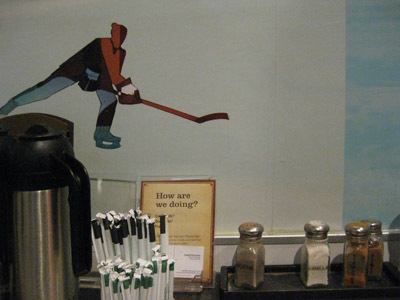 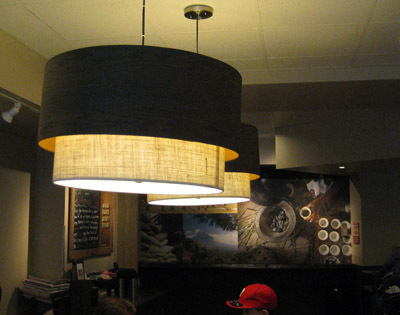 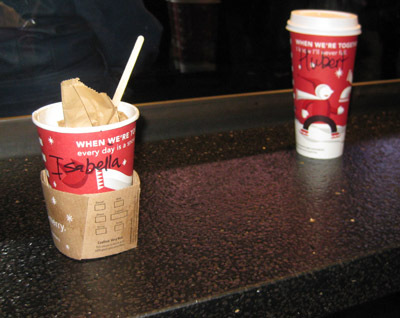 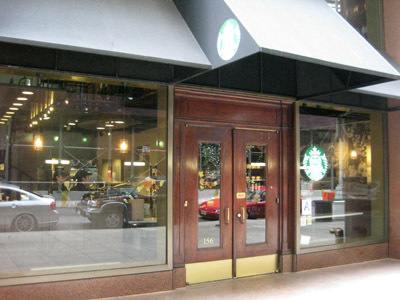 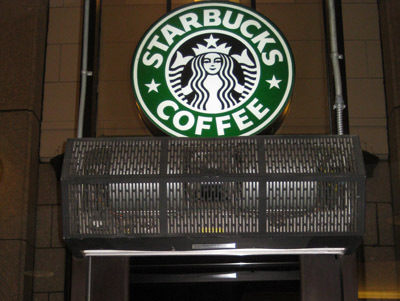 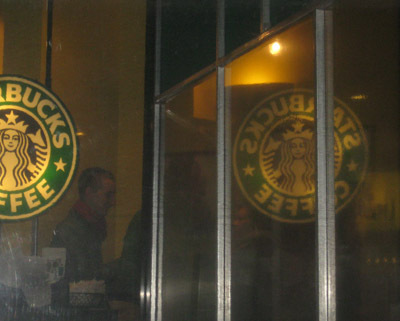 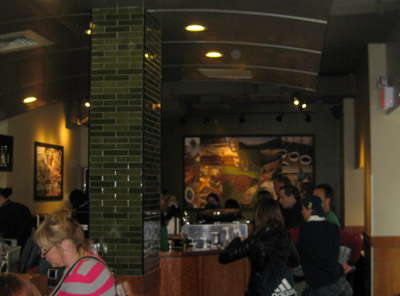 It celebrates the 40th anniversary since the first Starbucks coffee shop was opened in Seattle in 1971 by three friends, an English teacher, a writer, and a historian. 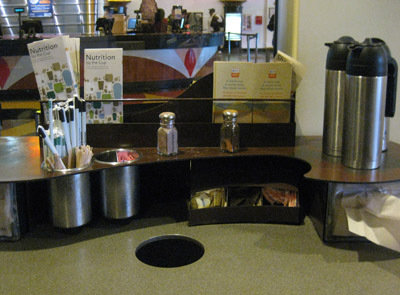 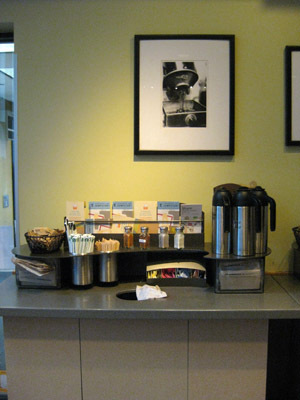 They learned the coffee trade and bought coffee during first year of operation from Alfred H. Peet, founder of Peet's Coffee & Tea in Berkley in 1966 (45th anniversary). 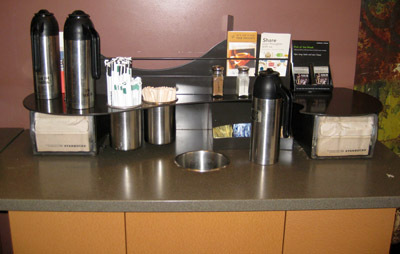 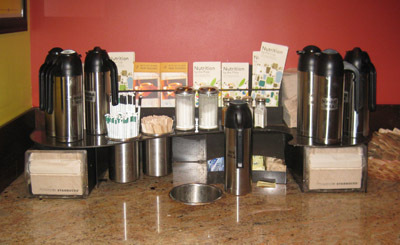 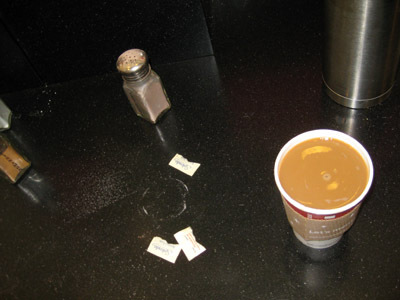 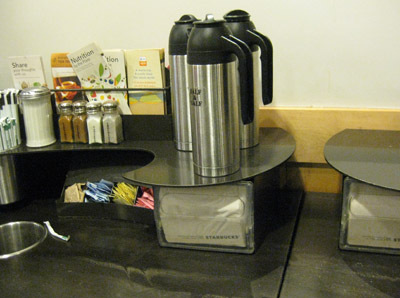 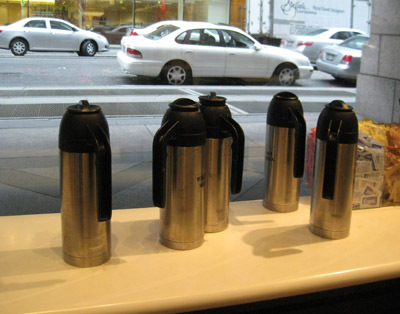 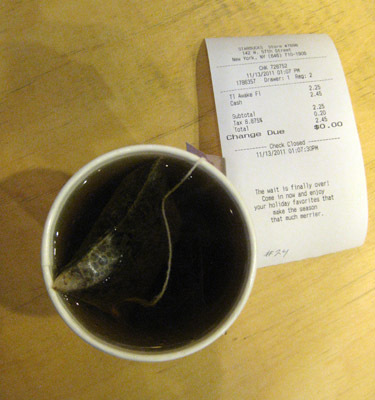 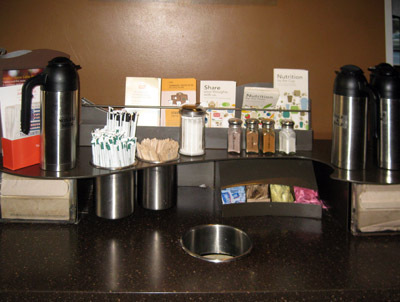 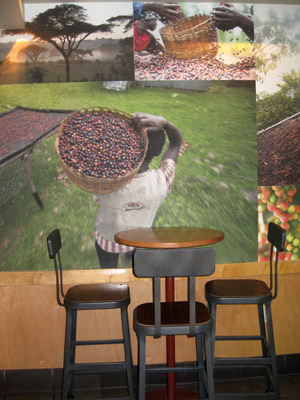 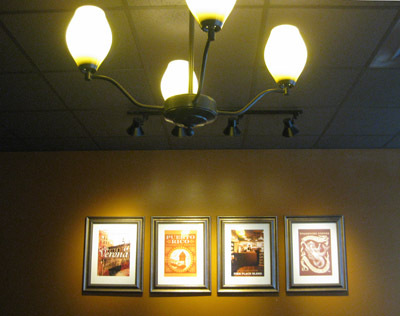 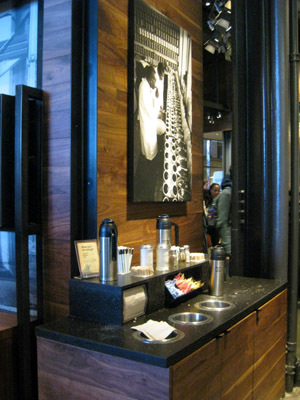 Peet popularized the taste for European coffee in California and sold his business in 1979 when he was 59. 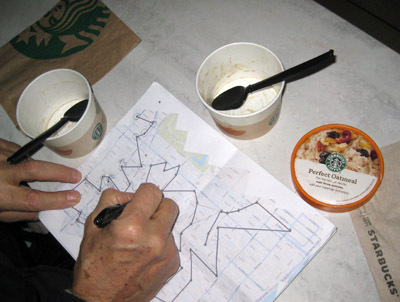 There are countless ways to connect 59 points into a constellation. 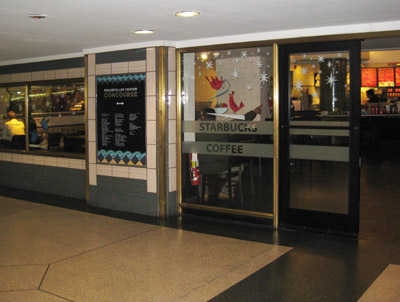 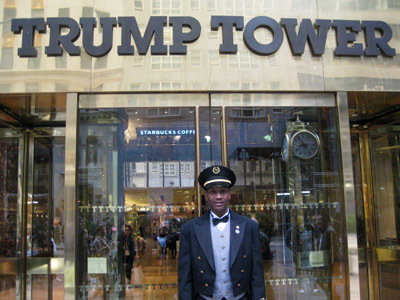 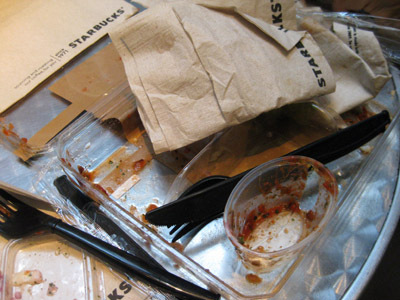 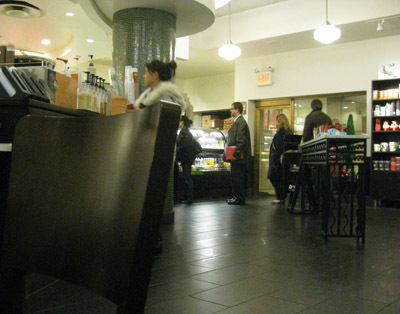 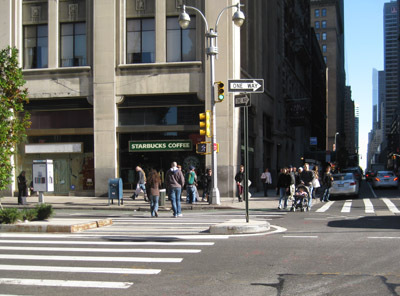 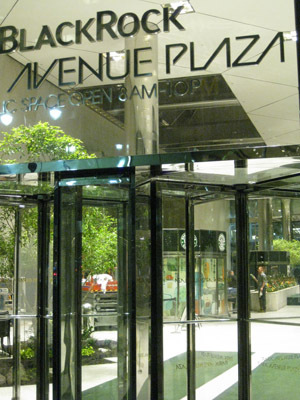 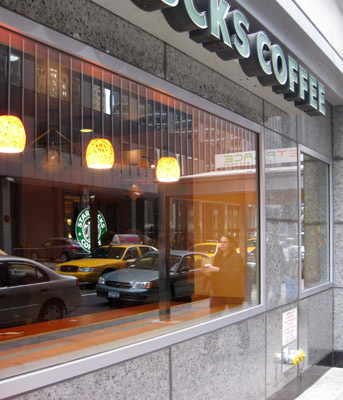 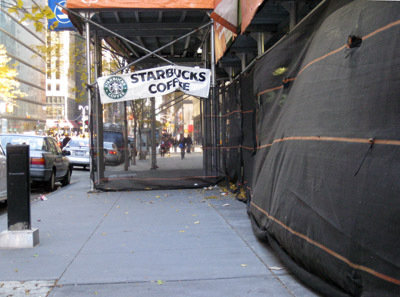 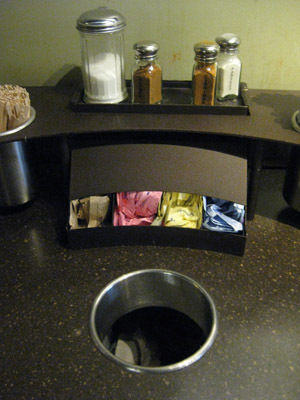 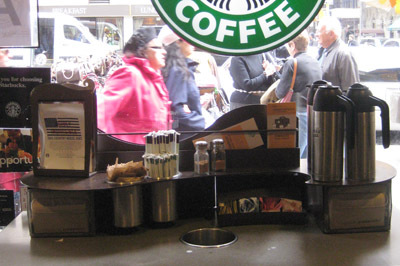 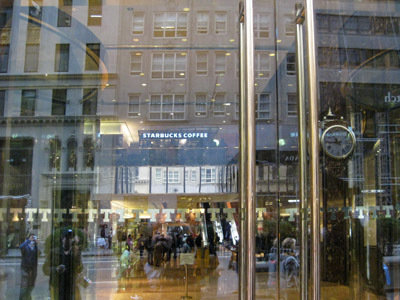 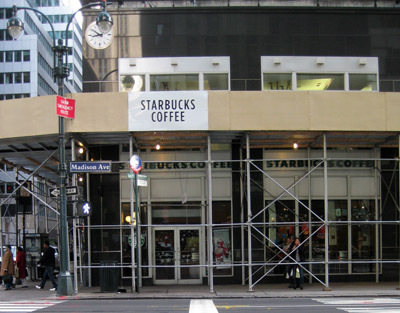 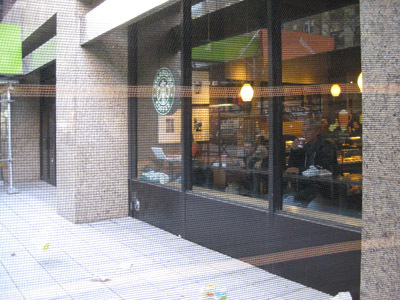 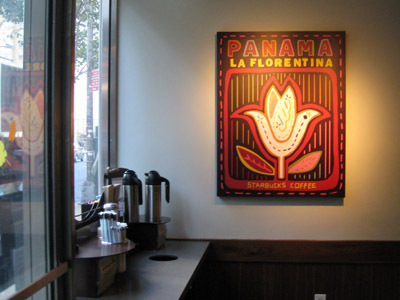 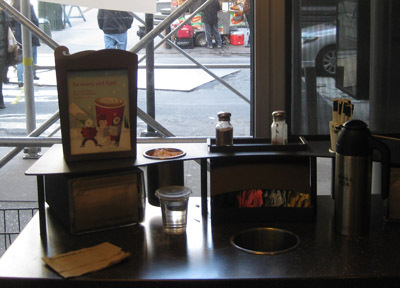 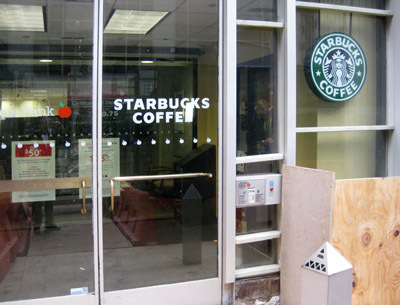 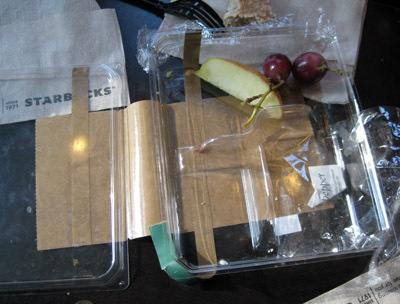 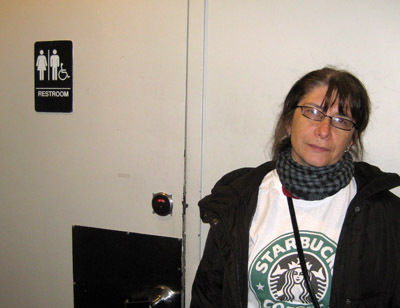 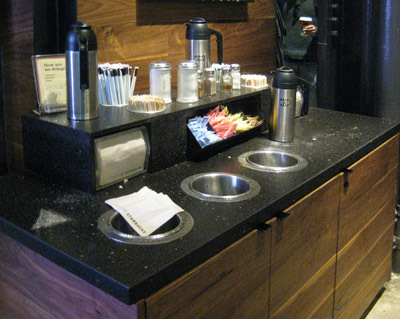 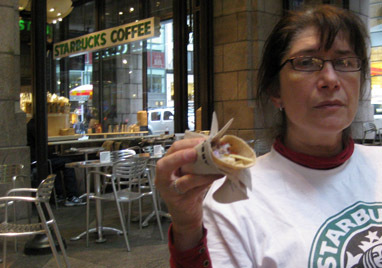 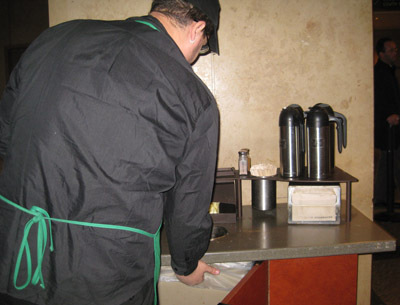 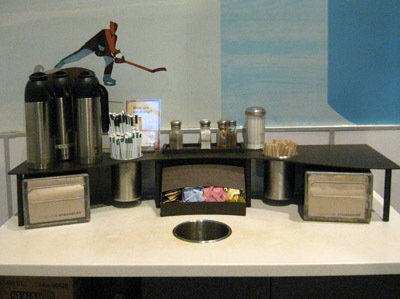 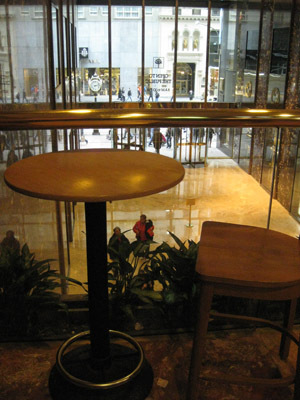 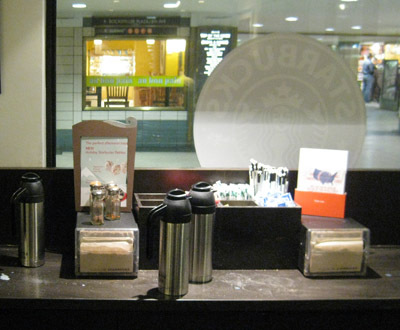 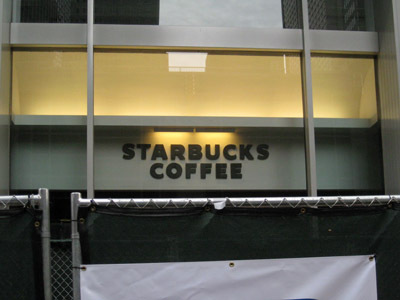 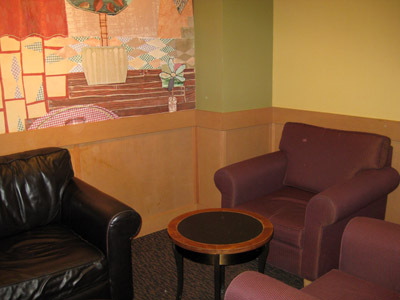 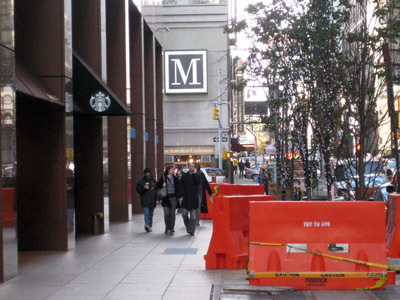 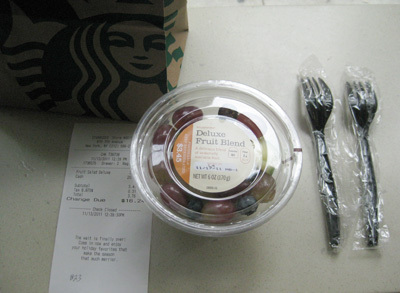 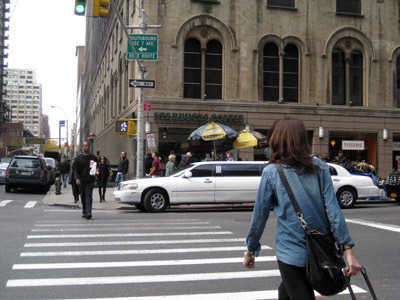 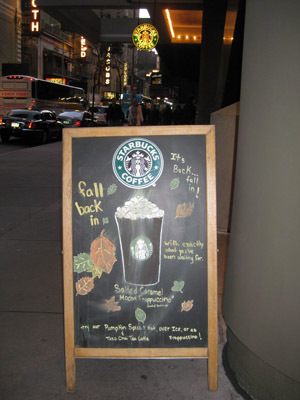 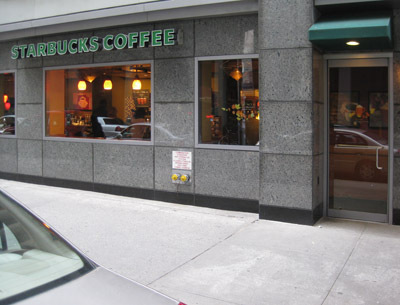 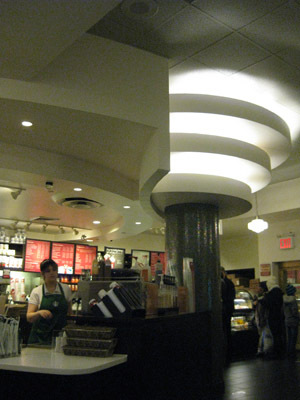 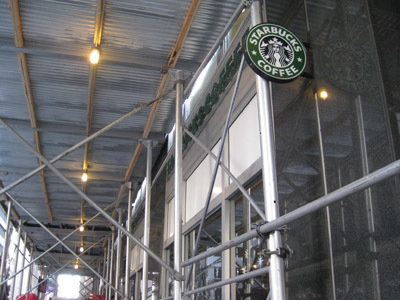 This project started on the corner of W. 59th Street and finished at 599 Lexington Ave. On the first day Hiram and Irina followed their plan to visit Starbucks, buying drinks in turn and sharing food. 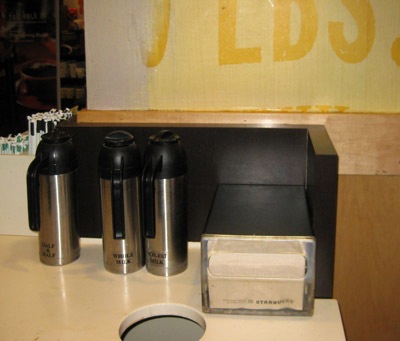 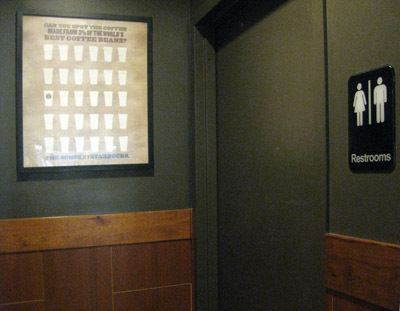 Some stores were visited for restrooms, some for supplements. 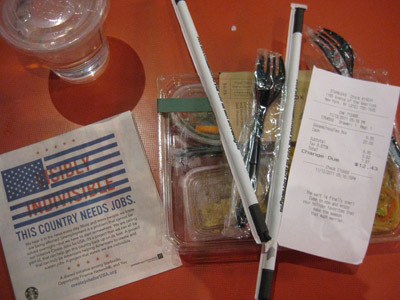 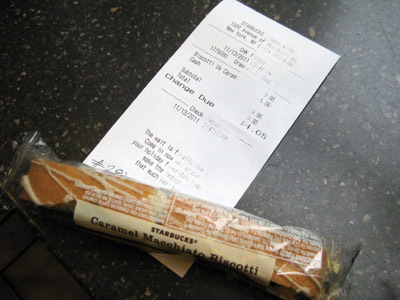 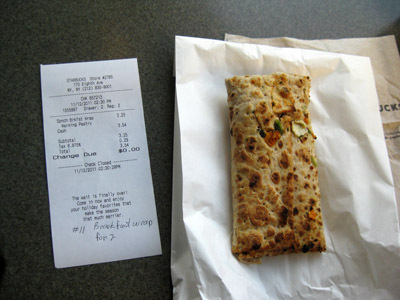 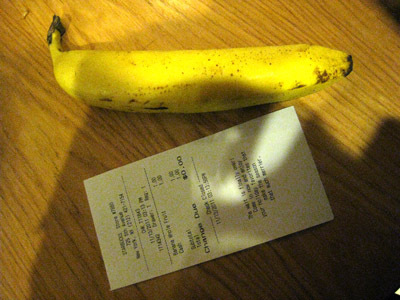 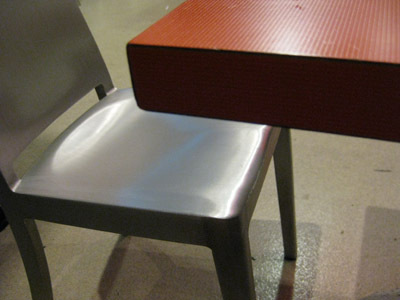 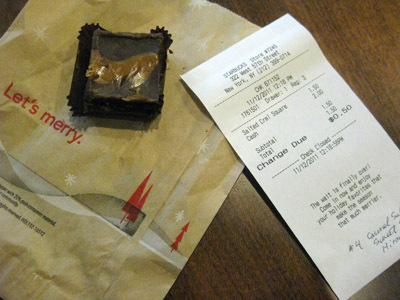 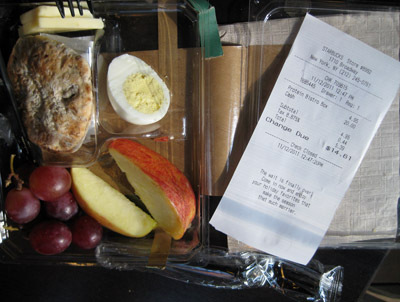 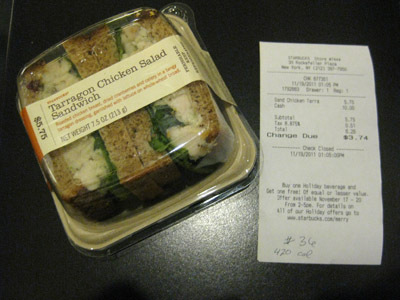 Video and photo documentation, while not officially allowed in the stores, was made as much as was possible. 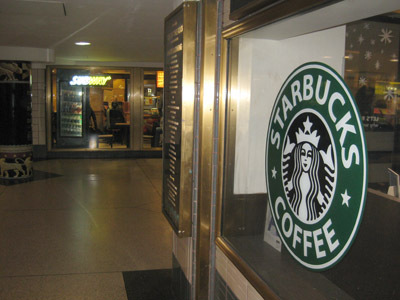 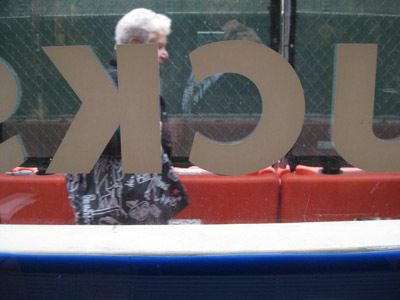 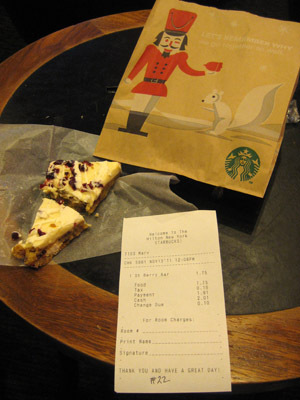 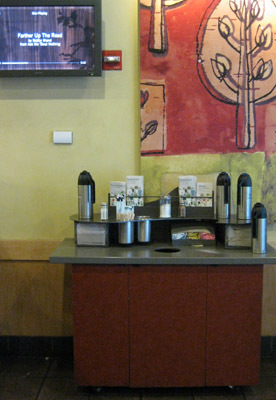 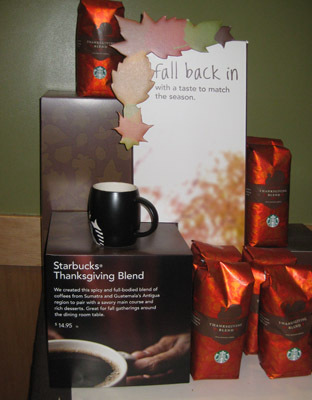 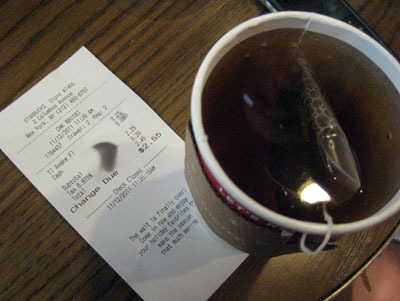 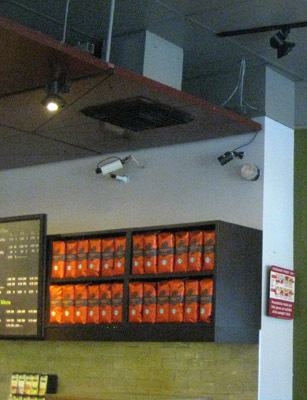 The tracking signal was activated from in front of each store immediately after the visit. 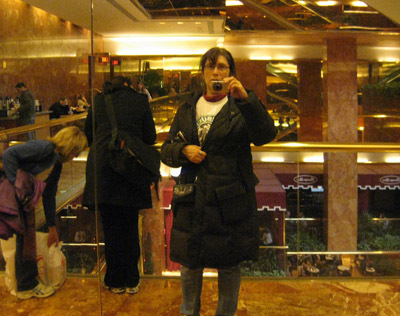 Lining up the gps device with satellites in a skyscraper jungle filled with competing cell-signals was the most difficult step of the Project. 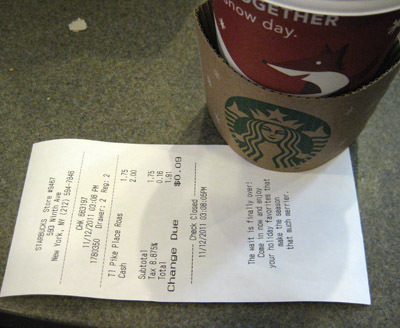 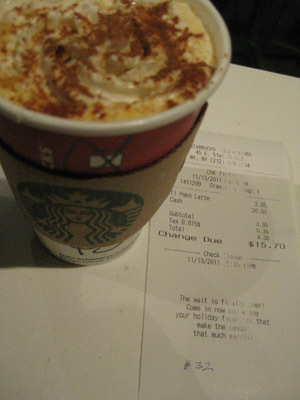 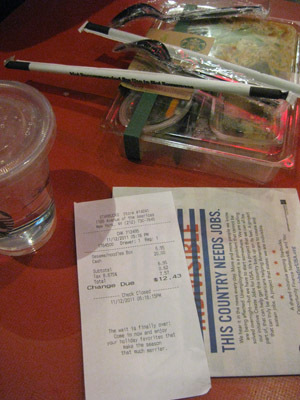 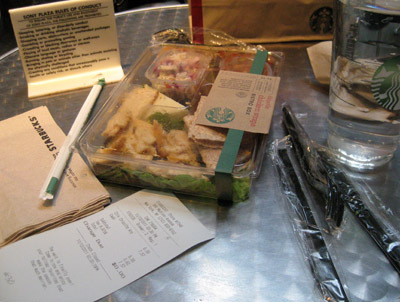 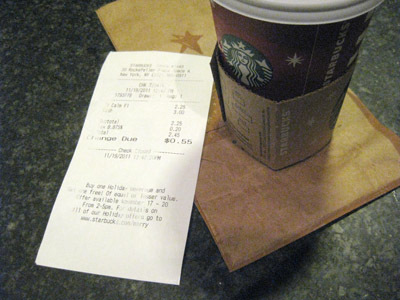 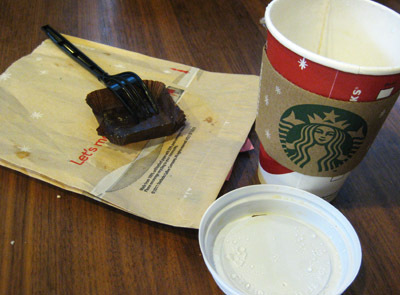 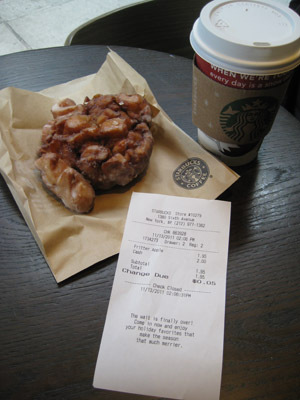 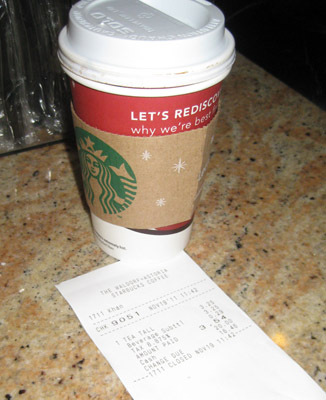 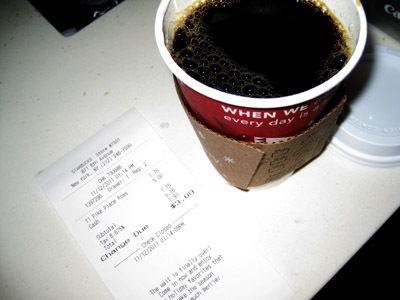 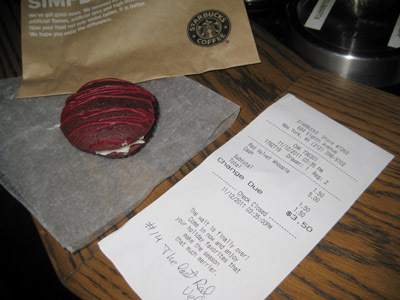 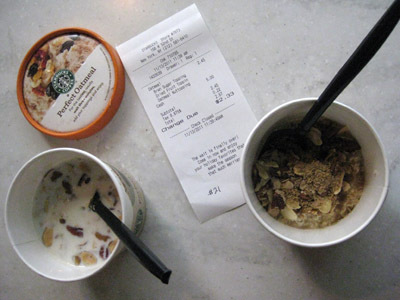 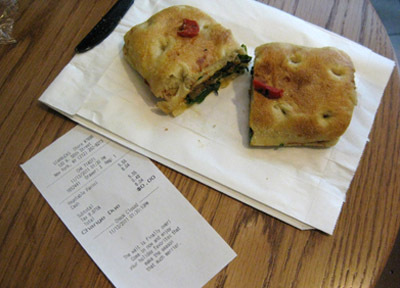 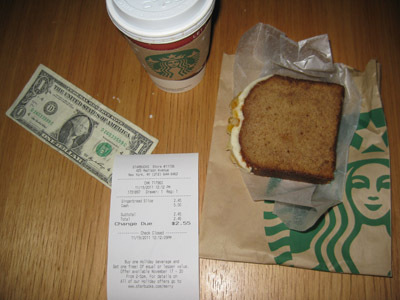 On the second day Hiram and Irina continued buying drinks in turn and sharing food, but they decided to buy something in each store to record the time of their visit. 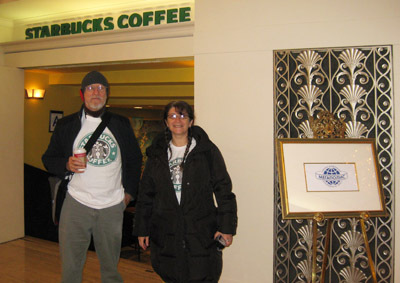 The first 40 shops were visited by Irina Danilova and Hiram Levy on November 12th, 13th and 19th. 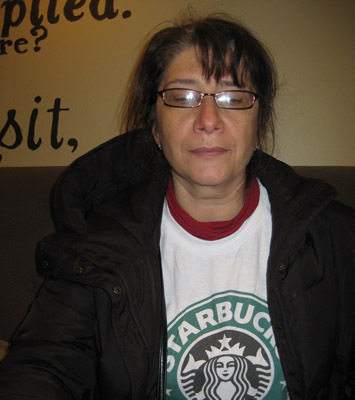 Olga Filatova substituted for Hiram for the last 19 on December 3rd and 4th. 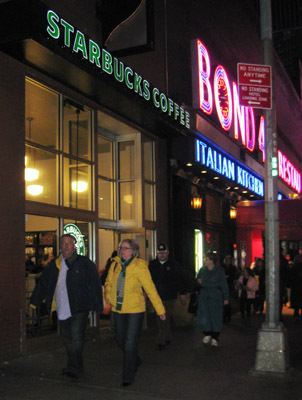 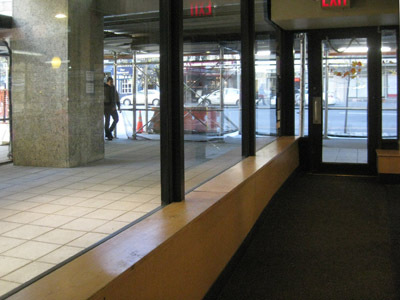 Borders closed all their US stores in 2011. 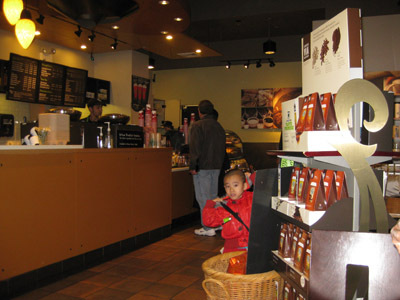 In “Borders Constellation” 59 recently closed stores were visited during a multi-week series of trips that started in far eastern Long Island, continued through southern Connecticut, greater NYC, New Jersey and the Philadelphia area, and finished near Annapolis MD. 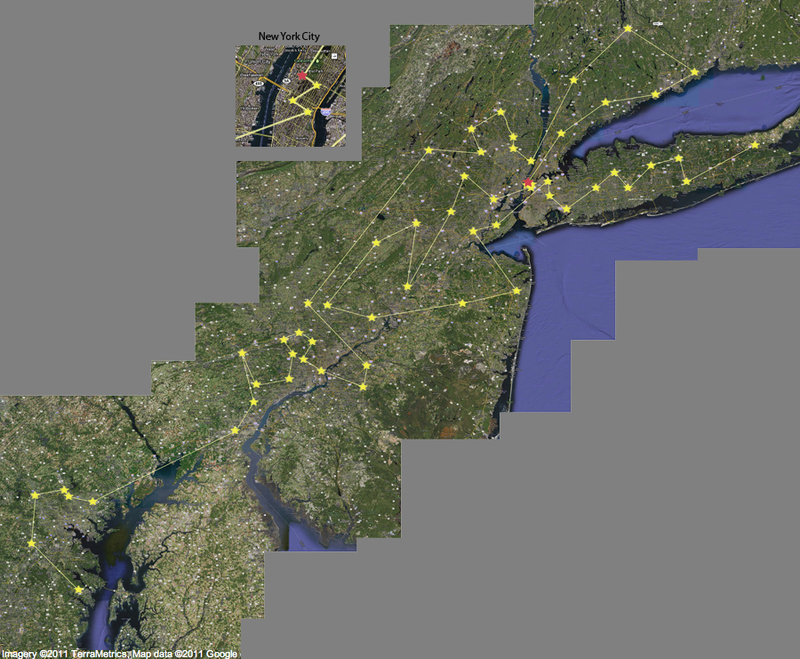 Extensive documentation was collected and a signal was transmitted from each of the 59 locations via satellites to an on-line tracking system. 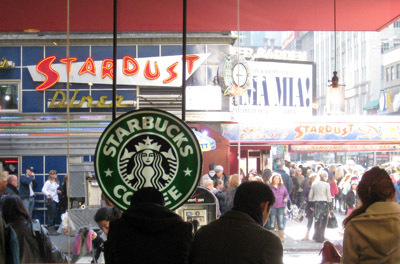 The “Constellation Borders” was created as a virtual fossil record of previous retail activity. 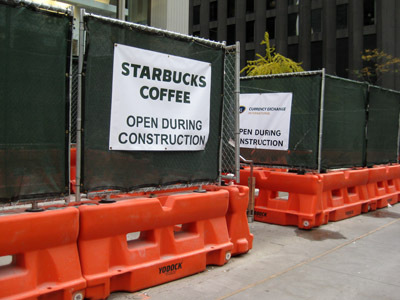 Much like the dinosaurs of old, Borders lost out to a changing technological climate and more adaptive foes.